A glass pumpkin patch at Morton Arboretum blows visitors’ minds. 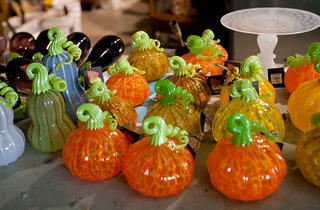 Photograph: Michael JareckiChicago Hot Glass artist Kit Paulson's glass pumpkins await transport to the Morton Arboretum. 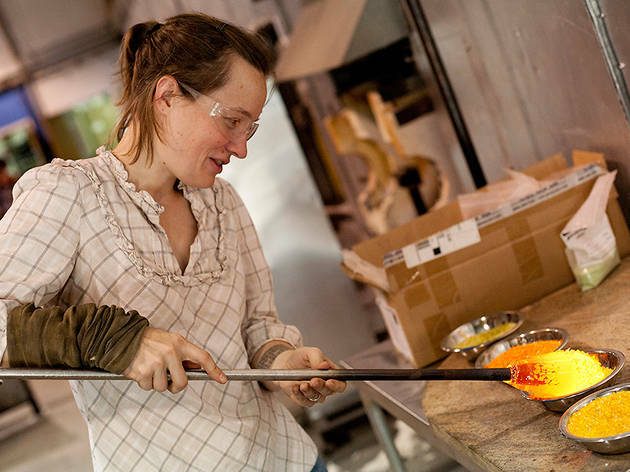 Paulson is one of 15 artists whose blown glass works will be featured in the Arboretum's Glass Pumpkin Patch Exhibit from October 17-21. 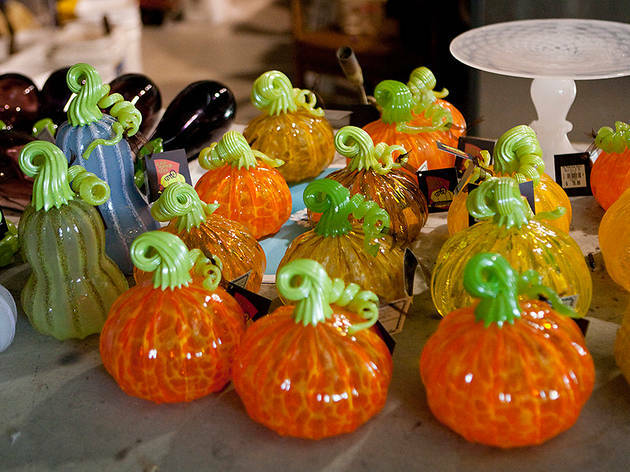 Approxiamtely 3,000 hand-blown glass pumpkins will be on display. 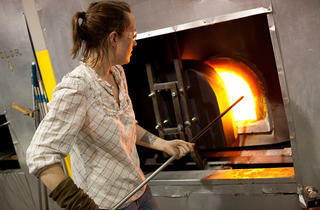 Photograph: Michael JareckiPaulsonscoops liquid glass from the furnace. Photograph: Michael JareckiPaulson "marvers" the glass. This helps to shape and center the piece. 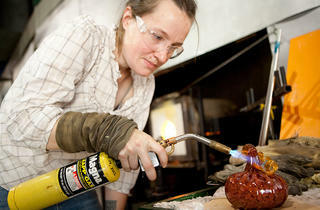 Photograph: Michael JareckiFrom a work bench, Paulson uses her shears to further shape the glass pumpkin. 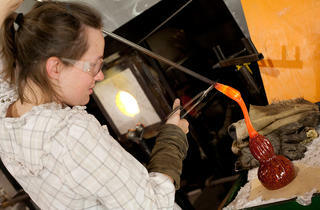 Photograph: Michael JareckiPaulson uses a blow torch to create a smooth finish on the thorn-edged stem. 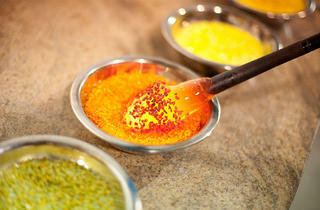 Photograph: Michael JareckiThe liquid glass is dipped into oxides known as "frit". 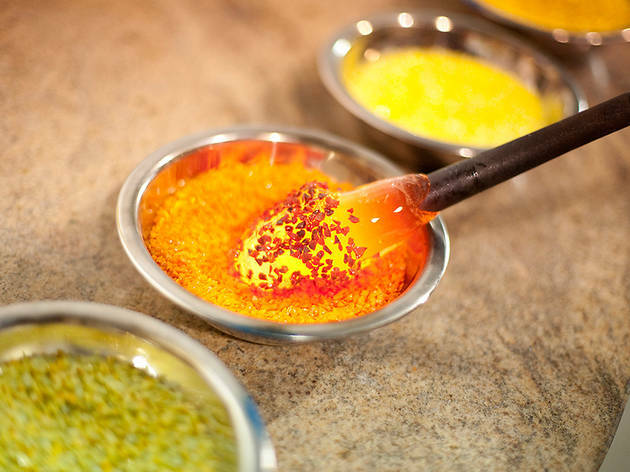 These particles are used to add color to the glass pumpkin. 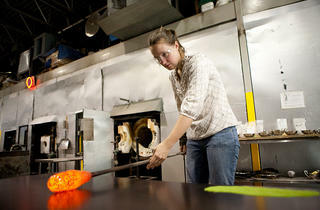 Photograph: Michael JareckiFor more complicated glass pumpkins, Paulson adds another coat of "frit" to the heated glass. 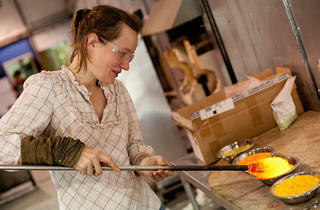 Photograph: Michael JareckiUsing a spare steel rod and jacks (tongs), Paulson adds a stem to the glass gourd. 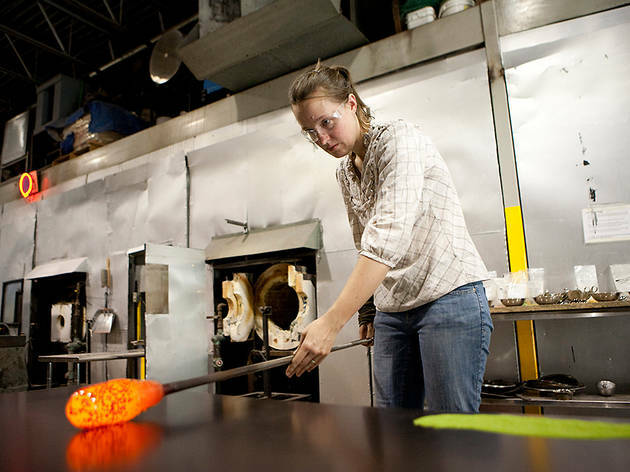 Standing in front of a 2,080-degree furnace, Chicago Hot Glass technician Kit Paulson doesn’t flinch as she dips the base of her blowpipe inside, scooping a mass of hot liquid glass. Last October, Paulson was one of a handful of Chicago artisans invited to make glass pumpkins for the Morton Arboretum’s inaugural glass pumpkin patch exhibit, a display of 3,000 glass gourds stretched out on the lush Arboretum West Lawn. The exhibit returns this year, giving visitors the chance to marvel once again at the outdoor showcase and attend demonstrations by more than a dozen artisans, including Paulson, who walked us through the process. “Participating in the debut [last year] was amazing!” says the Lincoln Square resident, preparing to blow into her pipe, a long rod that inflates the molten liquid latched onto the end of the device. 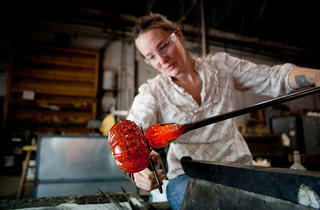 In the male-dominated molten medium, Paulson is a veteran with more than a decade of experience. 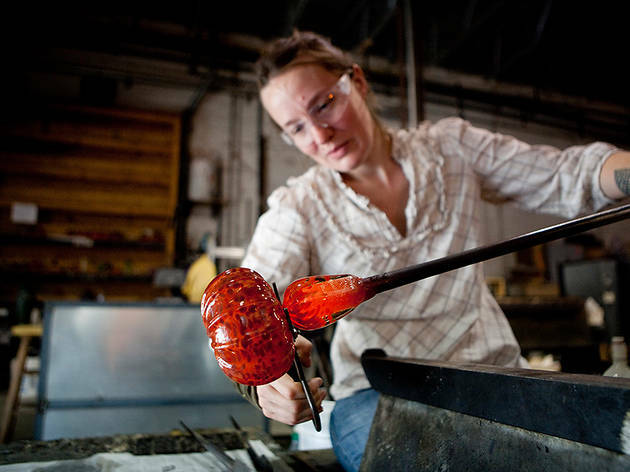 She developed an interest in glassblowing as a fine-arts major at Alfred University in western New York during the early 2000s. 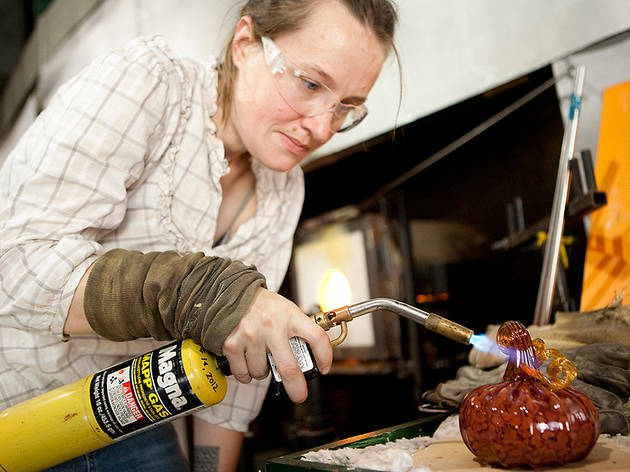 In 2005, an artist pal showed her how to make pumpkins. On my visit to the West Humboldt site where she works, Paulson makes two pumpkins with intricate winding stems and a more complicated squash in less than 30 minutes. She has the technique down to a science. 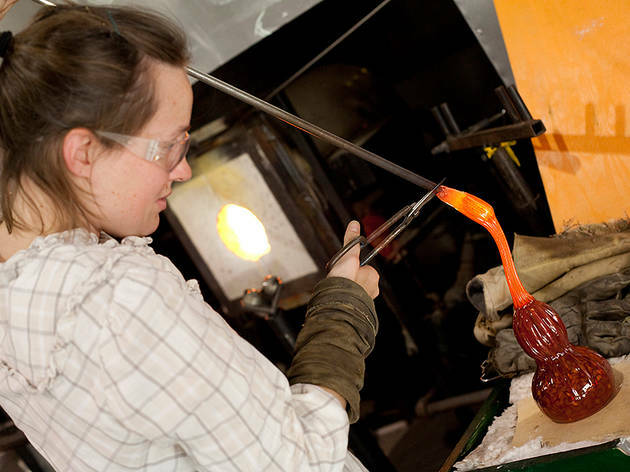 As she reiterates the importance of keeping the glass hot, she centers the small blob of lava on the base of her pipe by rolling it back and forth on a heat-absorbing marver board. 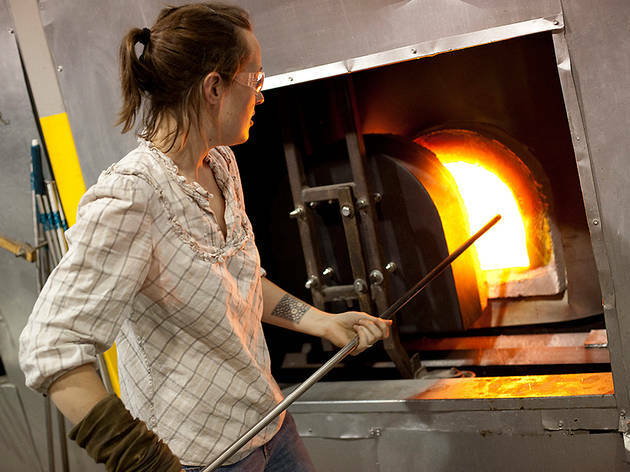 She then reheats the glass, which cools immediately, and coats it with frit—granulated bits of minerals and oxides used to create pigment. The Glass Pumpkin Patch is on display at the Morton Arboretum, 4100 Illinois Rte 53, Lisle (630-968-0074). Wed 17 and Oct 18, 1–5pm; Oct 19, 10am–1pm.